Spanish brand Mango seems to be aware of the fact that we are all slowly getting ready for fall and continues releasing its new fashion lines for the season. We have had the opportunity to admire Mango’s Premium fall 2015 and Violeta by Mango fall 2015 collections and now the next amazing line is here to inspire us. Designed for teenagers and the young fashion generation, the newest Mango Denim Dreams fashion line for fall 2015 is truly desirable and much anticipated. The ads feature a familiar face from Salvatore Ferragamo’s fall 2015 campaign ” Julia Bergshoeff, the 17-year-old Kate Moss and Giselle B‚Äö√†√∂¬¨‚à´ndchen lookalike who takes the fashion world by storm with her irresistible features like green eyes, freckles and ears, as fans insist. 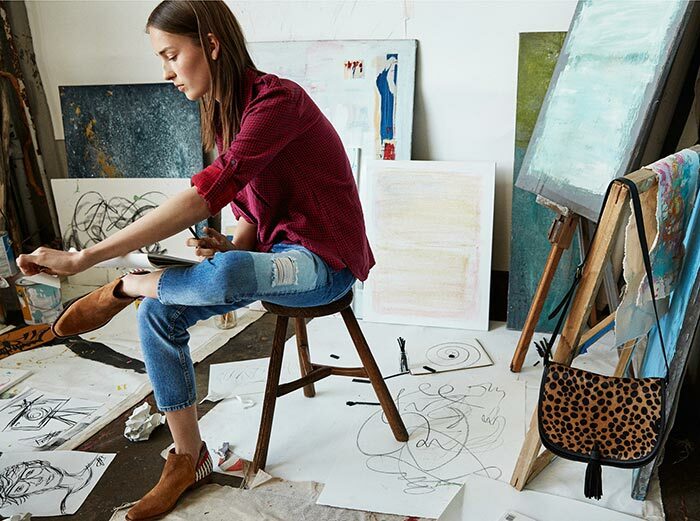 This time Mango goes for freshness, freedom and travel inspiration drawing images of an enthusiastic painter in the most casual chic garments. Titled by the name of the always-grand rock group Nirvana, “Smells Like Teen Spirit’, Mango’s new lookbook shows Julia rocking denim shorts, capris with ripped knees, denim jackets and pants all splashed with colorful paints, ’70s inspired button up jean skirts and denim overalls, which are the most desirable in the line. Denim is undeniably the most comfortable and wearable clothing item that is chic and fantastically cool at the same time. Looking through the images, we get the impression of a nice dialogue between the model and us: there are quotes from Julia that indicate the desires and aims of youngsters. “Big dreams are all I need to keep my feet on the ground,’ says Julia. Well, we have no doubt about it as long as we fell head over heels in love with the look of hers standing carelessly, but firmly in denim overalls wearing a lightweight monochrome white chiffon shirt underneath and black lacquer slip-ons. 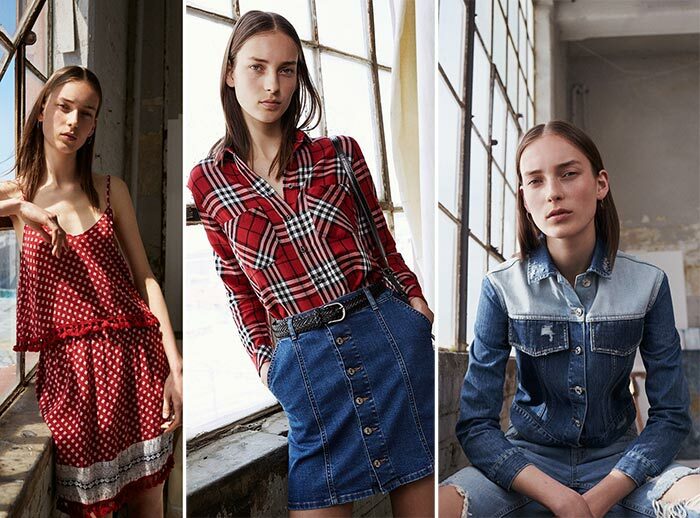 What we adore about the Mango Denim fall 2015 collection is that it has irreplaceable pieces in multiple hues of red, like the romantic oversized rust dress with lace-up details on the neckline and peasant-style sleeves, the burgundy checkered shirt with button-tab three-quarter sleeves, the lightweight loose skirt with spaghetti strap top of the matching pattern and the simple plaid shirt with chest pocket that will go equally well with denim pants and skirts. Let us not forget about the long-sleeve cream knitted sweater that is a must-have for any trendy girl’s everyday wear wardrobe in fall and winter. We see very few accessories here with silver triangle coin earrings, the animal-print saddlebag, the patterned leather belt and white canvas shoes being the only pieces used to enhance the looks. The minimalism of Mango has always proved right and the new denim line is no exception. Fashionistas and denim-lovers will appreciate this carefree, trendy and stylish line for sure. The pieces are so amazingly simple, yet nothing plain. We now are impatient to get some of these trendy pieces to join the fabulous Mango fashion community!